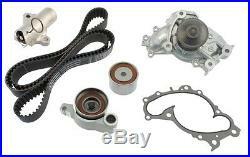 Engine Timing Belt Kit with Water Pump-w/Water Pump AISIN TKT-026. Marketing Description - 2000 : All OE manufactured components included in one combined kit with detailed professional instructions. Product Description - Extended 240 : Kit Includes: AISIN Water Pump, KOYO Idler Bearing, KOYO Tensioner Bearing, NTN Hydraulic Tensioner, Mitsuboshi Timing Belt. AAIA Part Type Description : Engine Timing Belt Kit with Water Pump. Country of Origin (Primary) : JP. Interchange Part Number : TCKWP257A, WP257K3A, GTKWP257A, AWK1229, TBK960AWP. Label Description - 80 : Engine Timing Belt Kit with Water Pump. Life Cycle Status Code : 2. Life Cycle Status Description : Available to Order. Other Part Number : WPK-0012, TBK257AWP, TB257LK2, PWPK-0012, TBW1005. See Item Specifics section for additional specifications about this part. To confirm that this part fits your vehicle, enter your vehicle's Year, Make, Model, Trim and Engine in the Compatibility Table. Also review the notes section in the compatibility chart for additional specifications about this part. This part generally fits Lexus, Toyota vehicles and includes models such as Camry, ES300, ES330, Highlander, RX330, RX400h, Sienna, Solara with the trims of Base Sedan 4-Door, Base Sport Utility 4-Door, CE Mini Cargo Van 5-Door, CE Mini Passenger Van 4-Door, CE Mini Passenger Van 5-Door, Hybrid Limited Sport Utility 4-Door, Hybrid Sport Utility 4-Door, LE Mini Passenger Van 4-Door, LE Mini Passenger Van 5-Door, LE Sedan 4-Door, Limited Mini Passenger Van 4-Door, Limited Sport Utility 4-Door, SE Convertible 2-Door, SE Coupe 2-Door, SE Sedan 4-Door, SE Sport Coupe 2-Door, SLE Convertible 2-Door, SLE Coupe 2-Door, Sport Convertible 2-Door, Sport Coupe 2-Door, Sport Sport Utility 4-Door, XLE Limited Mini Passenger Van 4-Door, XLE Limited Mini Passenger Van 5-Door, XLE Mini Passenger Van 4-Door, XLE Mini Passenger Van 5-Door, XLE Sedan 4-Door. The engine types may include 3.0L 2995CC V6 GAS DOHC Naturally Aspirated, 3.3L 3300CC 202Cu. V6 ELECTRIC/GAS DOHC Naturally Aspirated, 3.3L 3300CC 202Cu. V6 GAS DOHC Naturally Aspirated, 3.3L 3300CC V6 GAS DOHC Naturally Aspirated. This part fits vehicles made in the following years 2001, 2002, 2003, 2004, 2005, 2006, 2007, 2008, 2009. This item may interchange to the following part numbers from other brands. Brands: ACDELCO, AIRTEX AUTOMOTIVE DIVISION, ASC INDUSTRIES, AUTOZONE/AIRTEX, AUTOZONE/CRP, AUTOZONE/DAYCO, CARQUEST/GATES, CONTINENTAL ELITE, CRP, CRP CANADA, DAYCO PRODUCTS LLC, DNJ ENGINE COMPONENTS, GATES, GATES CANADA, IMPORT DIRECT WATER PUMP, IMPORT DIRECT WATER PUMPS/TIMING KITS, MASTER PRO SELECT WATER PUMP, MURRAY TEMPERATURE CONTROL, NAPA, NITOMA, PARTS PLUS, SKF (CHICAGO RAWHIDE), UNI-SELECT CAN/PRO SERIES WATER PUMPS Part Numbers: AWK1229, CPK1229, GTKWP257A, PWPK-0012, TB257LK2, TBK257AWP, TBK960AWP, TBW1005, TCKWP257A, TKT026, WP257K3A, WPK-0012. Established in 1954, Automotive Supply has been at the nexus of Wichita's automotive aftermarket for more than 58 years. In one location since 1975 our 60,000 square foot facility has what you need. We serve the professional installer as well as walk-in individuals in Wichita and surrounding areas. Portions of the part information on this page have been provided by WHI Solutions, Inc. The item "Engine Timing Belt Kit with Water Pump-withWater Pump AISIN TKT-026" is in sale since Saturday, June 27, 2015. This item is in the category "eBay Motors\Parts & Accessories\Car & Truck Parts\Engines & Components\Timing Components". The seller is "automotivesupplyinc" and is located in Wichita, Kansas.